A Verb for Keeping Warm: Yak, Alpaca, Anne, Verb = Love. Alrighty, there are 3 main components to this blog post. 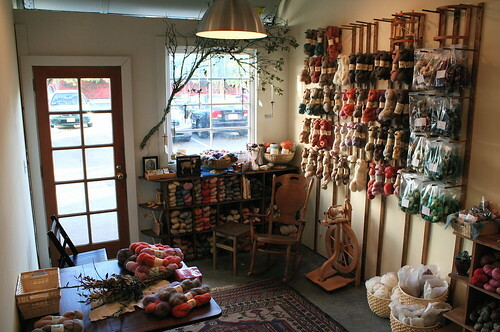 A store update offering new yarn and fiber. A photographic essay of our grand opening party. Last but certainly not least an announcement about a very special designer and our yarns. 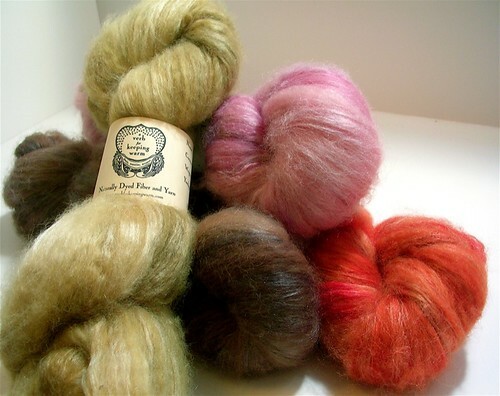 So, starting with the store update, we have some 50% yak/50% silk fiber in stock. We have been offering this fiber for the past 3 months, but the minute we finish dyeing it, fiber fiends gather it up and are gone. So, for this batch, we made twice as much, fed the fiends, and have some to put on our website. 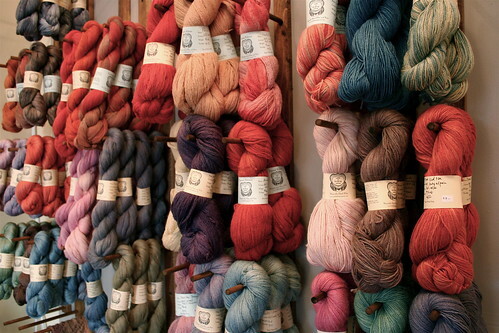 Also, we have the alpaca/silk yarn back in stock and are dyeing like crazy to replenish our previous, wide array of colors. 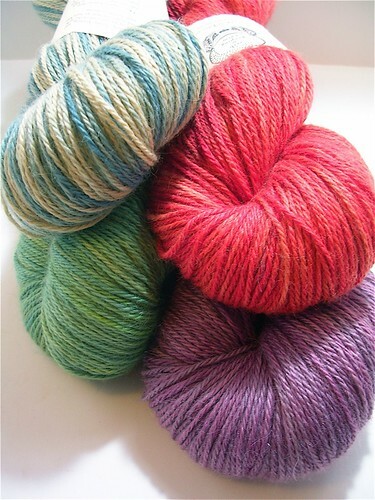 This yarn has been one of our absolute perennial favorites. It is soft and sport weight - which means that you can knit a beautiful lace patterned scarf fast. So, for those of you who are already advanced lace knitters and need a quick fix, this yarn could be the answer. Or, for those of you who admire all of the beautiful lace patterns currently being released but are a bit daunted by the challenge, this yarn provides a great jumping off point. Get a few lace patterns under your belt and you will be off and running. Which brings me to my next topic, speaking of lace patterns. 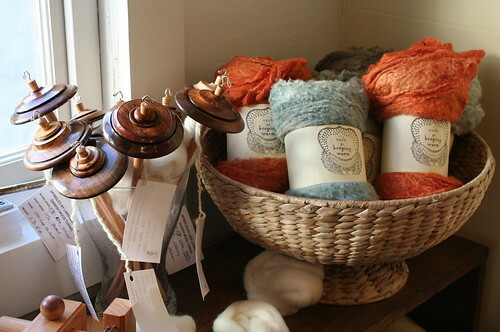 I am so (so) happy to announce that we have sent yarn over to Anne Hansen with the intent of creating patterns. I absolutely love Anne's work. It may be more accurate to say that I am in love with it. Over the past year, I have been following her blog, reading her tales about growing food, cooking food, and of course designing lace. In many circumstances she refers to patterns found in nature to influence and direct her work. I love how she gives us outsiders a view into her designing mind. I have been a bit shy about approaching her - but finally mustered up the courage. She posted about our yarns here. She has a wide variety of lace patterns ranging from those that are a bit more straightforward like this, this and this to the more complex patterns like this and this which I hope one day to aspire to. Now, to the store. The Grand opening party...it really could not have been any better. It was everything and more than I could have ever expected. Thank you to everyone who came or who over email offered words of encouragement and support. This has been an exciting time and I look forward to learning how the store will unfold and how Verb will continue to grow and unfold. At the end of the day, my strongest sentiment is gratitude. 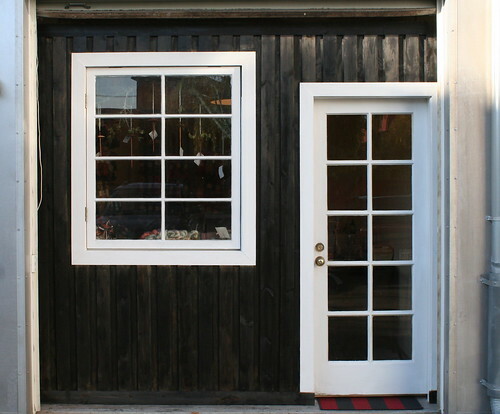 Our front door -- Welcome! 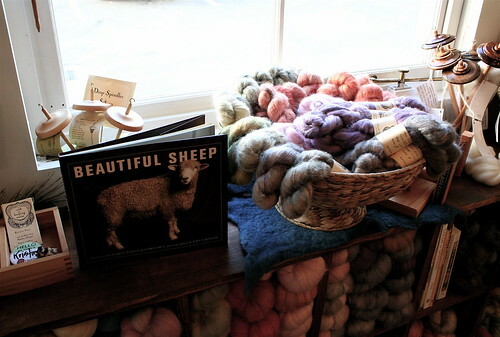 Silk & Sheep - Is there really a better combination? Maybe chocolate and coffee. I think you get the point :) Now, the only dangerous thing about all of this - is that I absolutely love this space - and it is warm. My studio is cold. So, I am finding it a little bit hard to leave this space. And, am procrastinating a bit when it comes to standing over the dyepots. All I want to do is sit in my new space and spin! Perhaps all of you can come over and sit in the space and spin for me. Then, I can live vicariously through you. 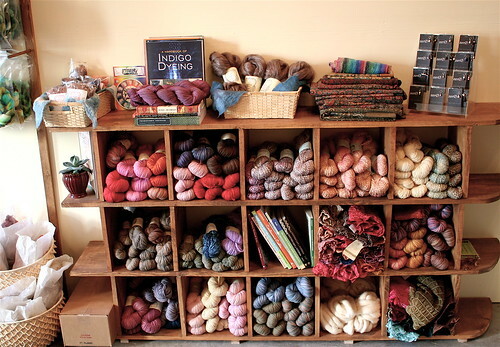 We aren't going to have a store if I don't continue to dye fiber and yarn, you know. Well, I will be there tomorrow (Friday) and Saturday from 10-5, if you are around stop on by. How exciting! 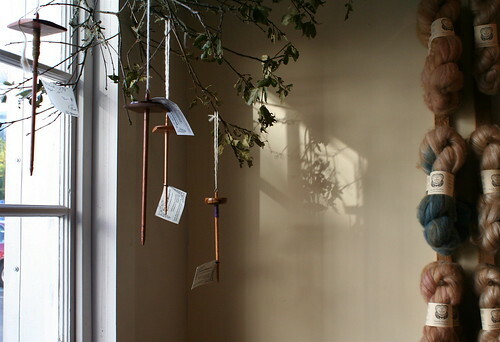 I love Anne Hanson's designs and her blog is such a wonderful glimpse into her world and thought process. Can't wait to see what she designs w/ your yarn! That yak fiber is breathtaking! I was really excited when I saw your fiber on knitspot the other day, I love Anne's designs and her patterns are so well written. Definitely looking forward to seeing what she does with your yarn. It is so absolutely gorgeous. Wish I could have come to the party. Belated Congratulations!